The Kashmere Stage Band won numerous awards, performed in Japan and Europe, and released classic singles that have been compiled by Now-Again, the reissue wing of Peanut Butter Wolf’s essential Stones Throw label. That’s an impressive achievement for anyone, let alone a high-school band from Houston. 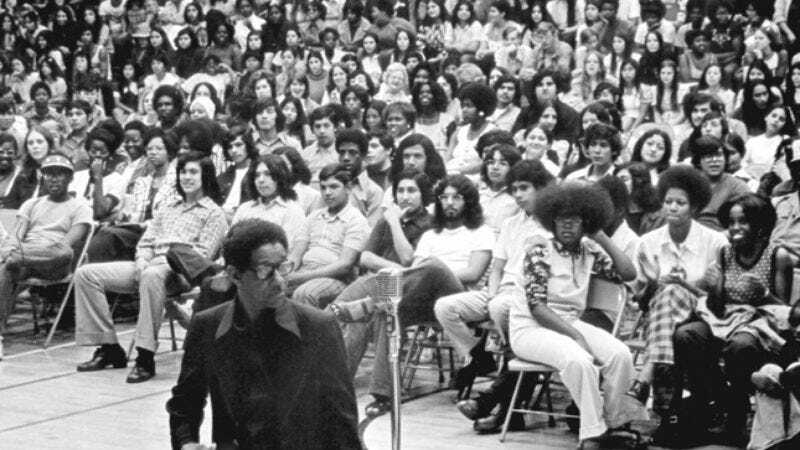 Throughout its late-’60s-to-’70s heyday, the Kashmere Stage Band defied the boundaries of what a school band could look and sound like. While their contemporaries trudged workmanlike through the great American songbook, Kashmere Stage Band director Conrad O. Johnson taught his students to play the music that was in their souls, not just the notes on the page. He empowered them to be the best musicians and people they could be, and was beloved by generations of pupils as a result. Thunder Soul tells the story of the Kashmere Stage Band, from its humble origins to its current international prestige. The film chronicles how Johnson fused funk with jazz to create a new, strikingly different sound and utilized Motown-style showmanship and dancing to further separate them from their would-be peers. It goes on to document how a group of proud alumni reunited decades after graduation to perform a concert in tribute to their ailing, frail 92-year-old mentor. They’re no longer the beautiful, skinny kids they once were, but they’ve held onto their ferocious passion for music. Thunder Soul presents Johnson’s reign as something of a benign dictatorship, but even the most benign dictatorships leave scars; Johnson could be a harsh taskmaster. Thunder Soul represents a feast for the senses, a soulful celebration of the black musical renaissance of the late ’60s and ’70s, but the filmmakers don’t seem particularly interested in peering beneath the dazzling surface. Thunder Soul sometimes feels too good to be true, especially during a climax that would come across as hopelessly manipulative and unrealistic if it appeared at the end of a narrative film. Everything here is pitched relentlessly toward uplift, but at least that uplift is genuine, the product of one visionary’s indomitable will and a musical universe he brought into existence through vision, dedication, and plenty of stubborn hard work.